In 2018, we launched the Solidarity Economy Giving Project to support cooperatives, gardens, CSAs, and cooperative incubators to secure funding for work that is vital to their success, but not currently funded by philanthropy or government sources. In the first year we raised $52,000 and redistributed $47,000 to 22 different cooperatives and gardens. These grants of between $500-$5,000 covered essential costs for our members who are locked out of other funding streams, such as: renovating an apartment in a limited equity housing cooperative, organizing trainings hosted out of community gardens, emergency funding for worker-owners evicted from a commercial kitchen space, conflict resolution training, and more. 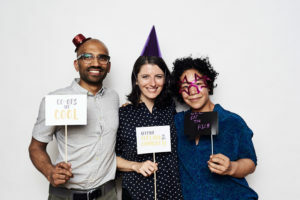 Solidarity Economy Giving Project funds come from a Giving Circle and an annual party. Giving Circle members gather to learn more about the cooperative and solidarity economy, the work of CEANYC members, and the challenges cooperatives face in securing financial resources, especially through philanthropy. Participants each make a meaningful contribution to the Project and co-host an annual party. Be sure to save the date to join us at DCTV (87 Lafayette Street) at 7PM on May 1 for Thank U, Next (System): A May Day Giving Party for the Solidarity Economy. Read the full report to learn more about how the Giving Circle works, our grantees, and how to get involved! Cooperative Economics Alliance of New York City (CEANYC) busca fortalecer y expandir las iniciativas dirigidas por la comunidad y controladas democráticamente – desde cooperativas de trabajadores, financieras y de consumidores, hasta fideicomisos comunitarios de tierras y jardines comunitarios, vivienda por ayuda mutua y cooperativas de vivienda para personas y familias de bajos ingresos. Nuestra meta es construir una economía basada en los valores de la justicia social y racial, la sustentabilidad ecológica, la cooperación, el mutualismo y la democracia. Hágase un pagado seguro por nuestro página de Flipcause.